In an effort to attract more users, DVD-kiosk service Redbox is running a promo from February 26 to March 1 where customers can rent a game for a day at no cost. The deal offers a choice of 30 different video games — Super Mario Bros. Wii, Soul Calibur V, Call of Duty: Modern Warfare 3 included — for consoles such as the Xbox 360, PS3 and Wii. 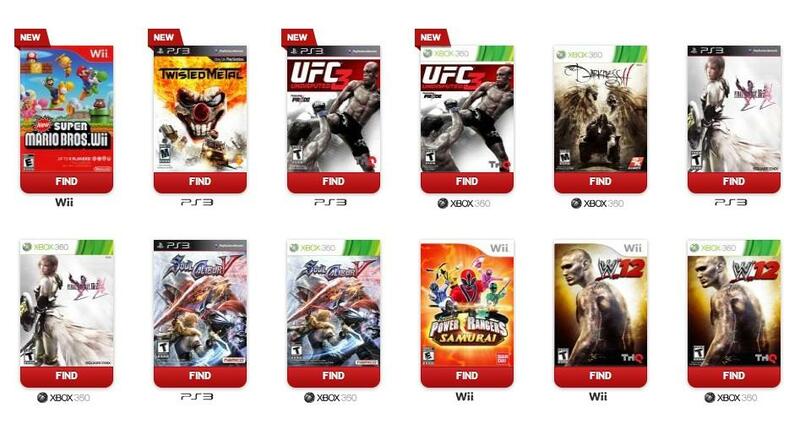 Of course, with games usually available from Redbox for $2 a day, it’s a modest saving, but hey, a freebie’s a freebie. After the first day, if the game isn’t returned, the usual rate applies and it becomes not a freebie. Redbox’s website explains that the offer is only for online reservations and that a payment card is required. Those interested simply need to head over to the offer’s web page and click on the game they’d like to rent. You then enter your zip code whereupon you’ll be presented with a list of kiosks in your area holding the game. Choose the kiosk, hit rent and proceed to the checkout page – new users will be asked to sign up first, of course. Redbox will be hoping the promotion goes towards increasing awareness among consumers that yes, besides movie rentals, games are also available as part of its service. The company only rolled out game rentals nationwide in June of last year, so it evidently feels the need to give the fairly new service a bit of a push. The offer should also ensure that it picks up a number of new members — members that will pay for rentals after having taken advantage of the free offer. Coinstar’s Redbox has been having a busy time of it lately, with the company recently announcing it would be taking on video streaming giant Netflix by joining forces with Verizon later this year to offer its own streaming service. The move comes in response to Redbox’s realisation that consumers are moving away from DVD rentals in favor of online services and to survive it has no choice but to move with the times. Only this week it was reported that 33 percent of existing Blockbuster stores — that’s 500 in all — would be closing down nationwide, though arguably this has as much to do with Redbox surrounding many Blockbuster stores with its kiosks as it does with consumers moving away from physical rentals. Redbox was founded in 2002 and currently has some 30,000 kiosks around the US, located in a wide range of establishments such as convenience stores and pharmacies.